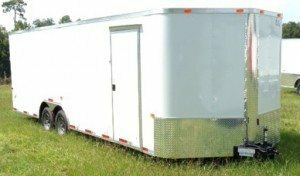 We offer great tandem axle trailers at low, low prices. 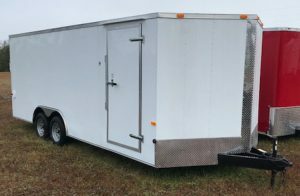 Our tandem axle trailers are made with all tubular steel (strongest possible), triple tube hitches (many of our competitors only have two tubes in their hitch), LED tail lights, 3/8" plywood walls & 3/4" plywood floors. We have two different models. 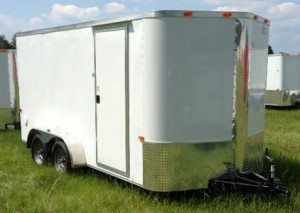 The Ranger series, which is our entry level trailer and our Elite series which is our top of the line trailer. The Elite series has a 24" stone guard the Ranger series has a 16" stone guard. The Elite series has all LED lights (tail lights and running lights), the Ranger series has incandescent running lights. The Elite series comes with Radial tires, Ranger has bias ply. The Elite Series has a choice of 6 colors, Ranger comes standard in white. Elite has a bullet or flat nose, Ranger V-nose or flat nose. Standard interior height for the Elite series is 6' 3" while the standard height for the Ranger Series is 6'. The walls of the Ranger series are 24' on center while the walls of the Elite series are 16' on center. The Ranger series offers limited customization while the Elite series is fully customizable with our options list. 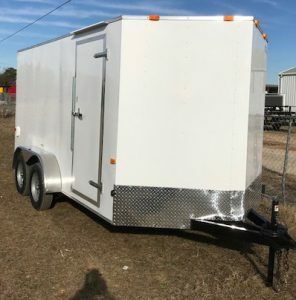 If you have any questions about our tandem axle trailers please call us at 727-346-6423 or use the chat button on the right.